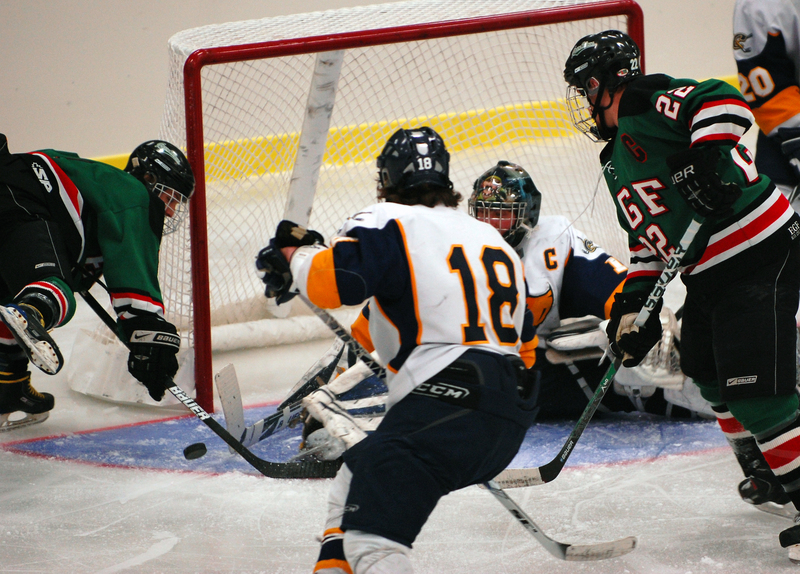 Twenty years from now, when Crookston’s Morgan Terpstra looks back on the first boys hockey game played at the Crookston Sports Center, he most likely will have forgotten about the controversial finish that secured a 6-5 overtime victory for East Grand Forks. No, it is the beginning that Terpstra always will remember in full Technicolor detail. And, after all, that’s what this day – Saturday, Jan. 30 – was all about. 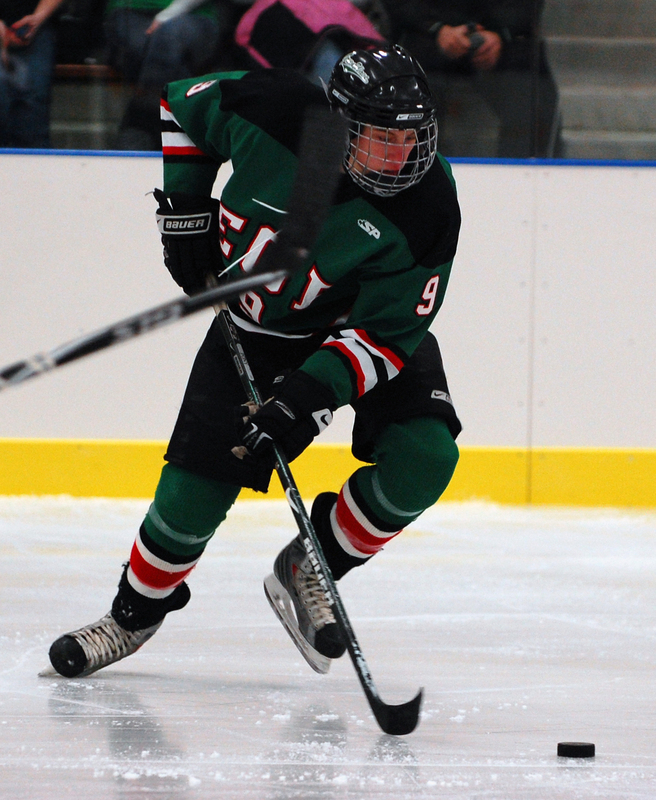 Terpstra was there for it all, from the ribbon cutting to the opening ceremonies, the warmups, the national anthem, the ceremonial puck drop and, best of all, his skate blades touching the rink for the first time when the starting lineups were announced. Terpstra raced onto the ice at top speed when his name was called and then, really, never slowed down. 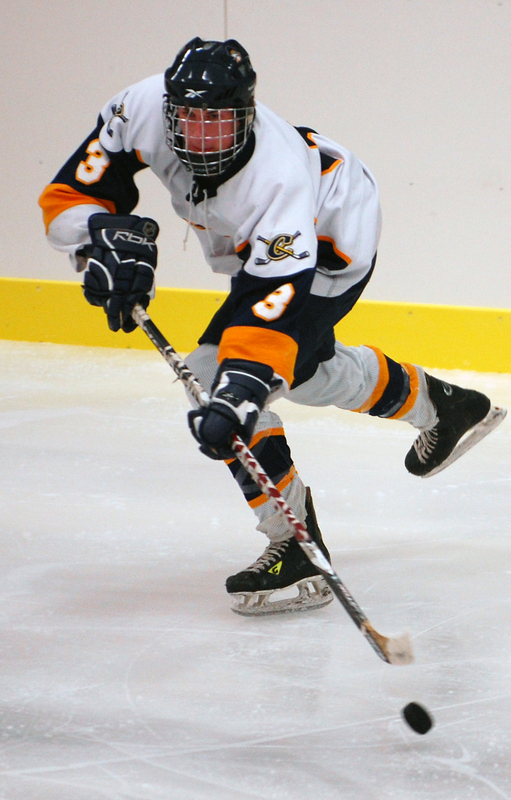 He scored two goals in the loss and just missed getting a third on a breakaway. 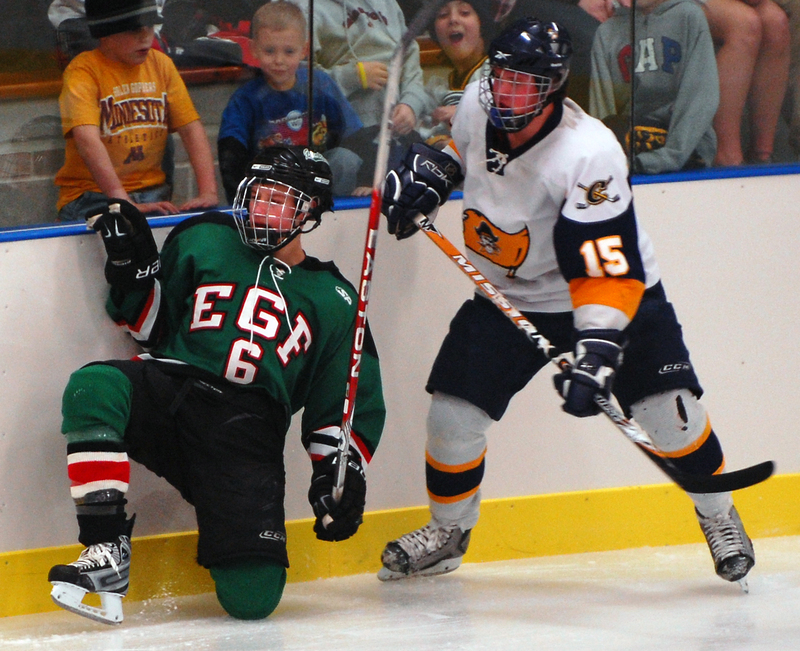 He also was on the receiving end of at least three punishing checks and, even after the final horn had sounded, was still going full bore as he tried to convince the referees that the final goal should be nullified because at least one East Grand Forks player was in the crease. 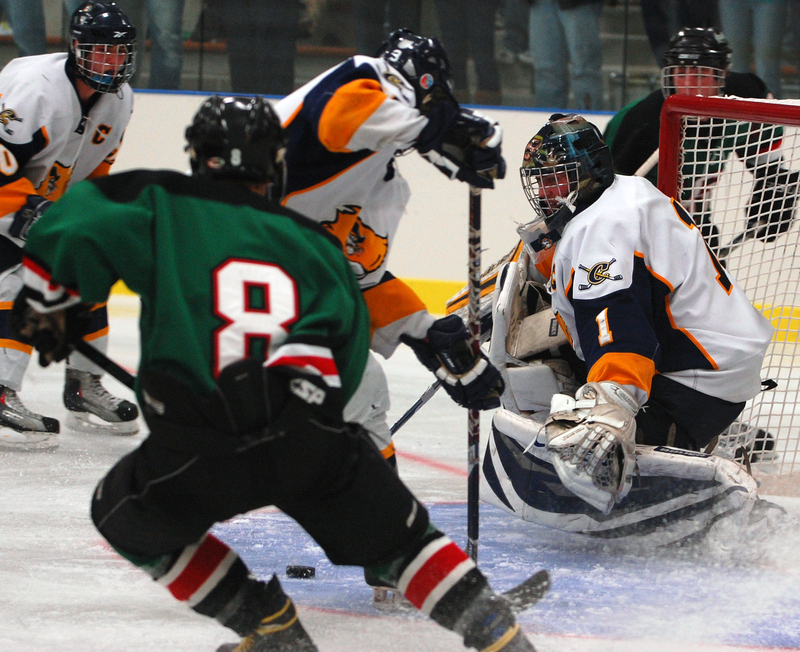 The game between the rivals offered the full house estimated at 1,800 a little of everything. 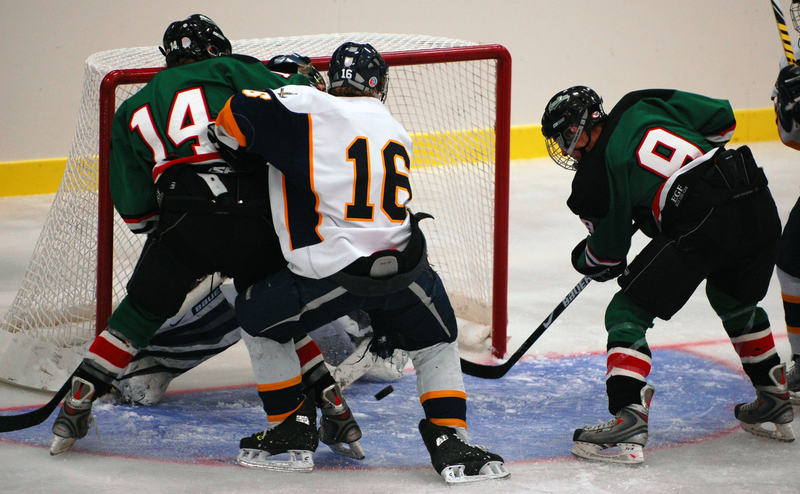 There were shorthanded goals, power-play goals, breakaway goals, top-shelf goals and, of course, controversial goals. Sprinkled in with all those goals were at least as many massive collisions that, as it turns out, did more than just rattle teeth. 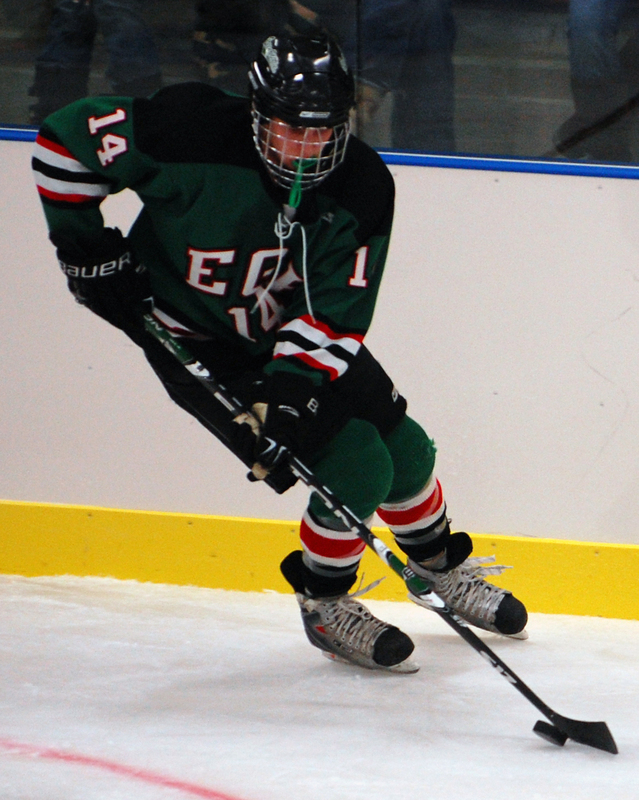 Jake Useldinger, East Grand Forks’ career scoring leader, had two goals against the Pirates. 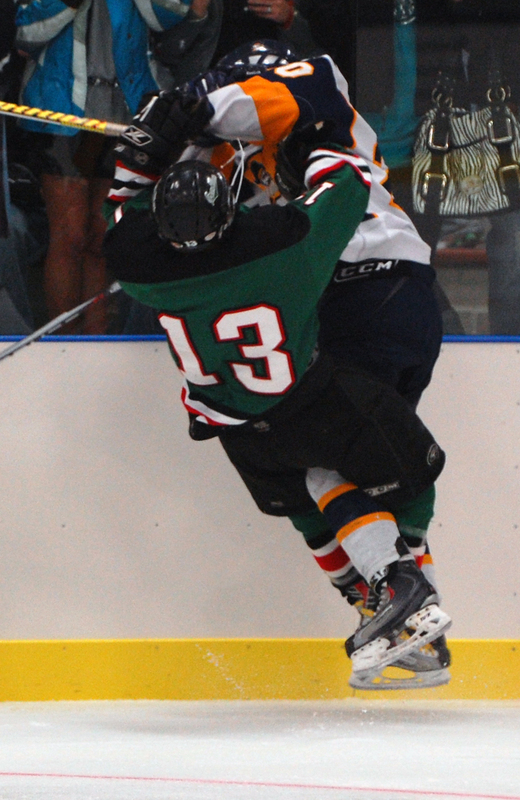 He also absorbed several heavy checks, including two by Crookston giant Nick Regeimbal, who weighs well over 200 pounds. After one of those run-ins with Regeimbal, Useldinger skated away without a portion of one of his front teeth. 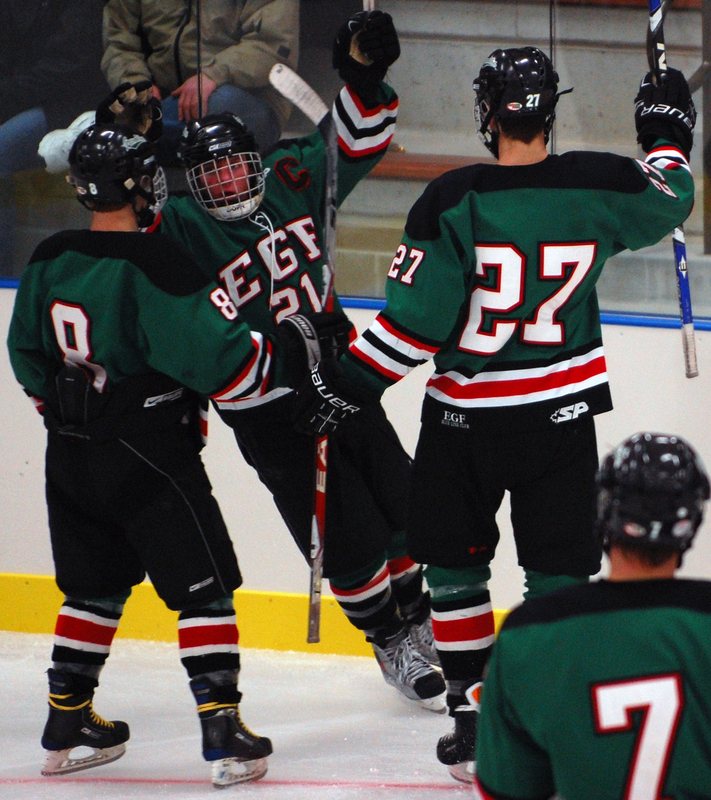 Right to the end, Useldinger refused to let his teammates forget about his sacrifice. 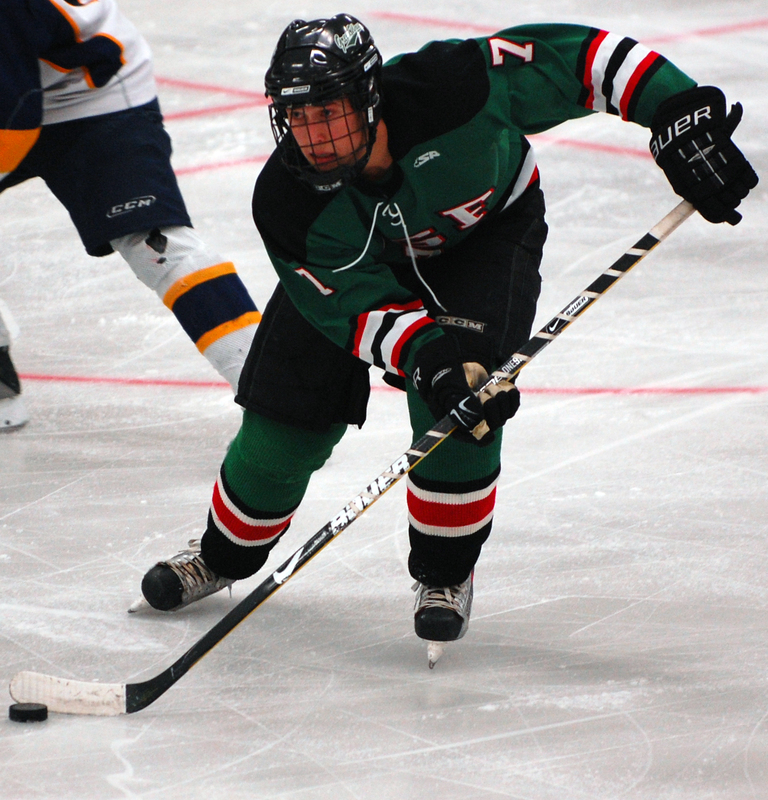 Zack Lawdermilt had a hat trick for the Green Wave and forced the overtime when he rifled a shot high and hard over Crookston’s Nick Biermaier with 3:41 left in the third period. 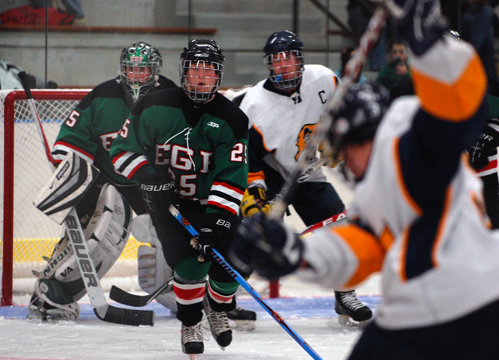 “That’s a goal-scorer’s goal there,” East Grand Forks coach Cory Chupka said about the shot that was launched from a tough angle and needed to be perfectly placed. 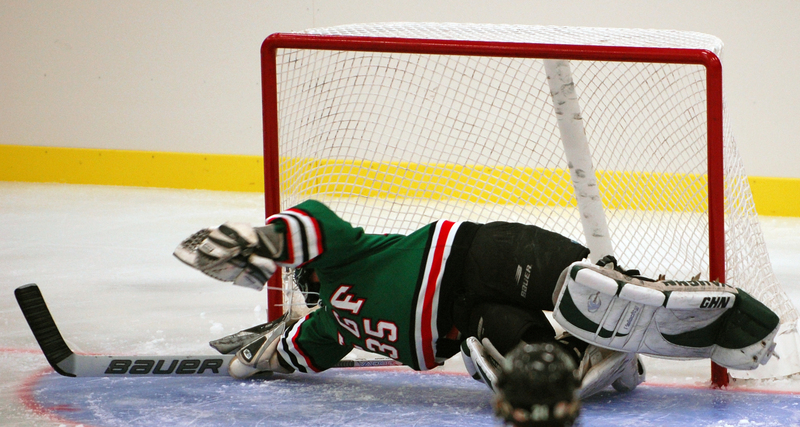 The winning goal was much less picturesque, although certainly more dramatic. 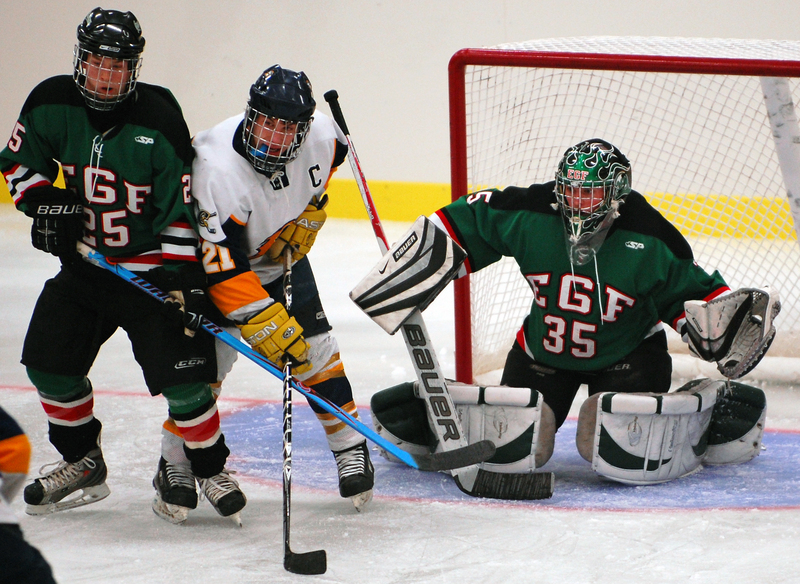 East Grand Forks, which had rallied from deficits of 4-2 and 5-3, won it when Knopp slammed a loose puck in the crease past Biermaier. 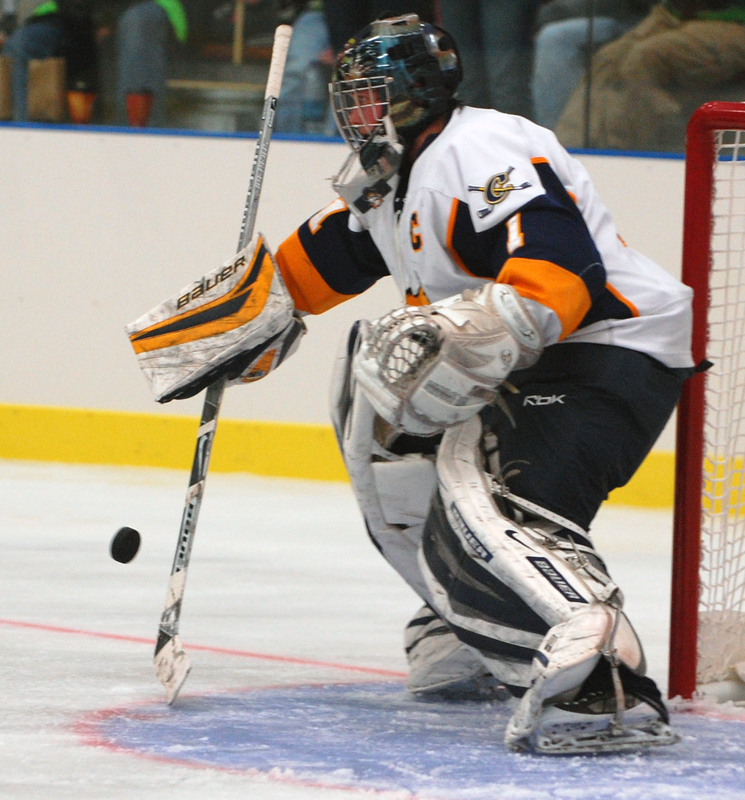 Knopp insisted he wasn't in the crease when he scored, although it appeared he at least had the toes of his skates in the crease area when he banged home the puck. 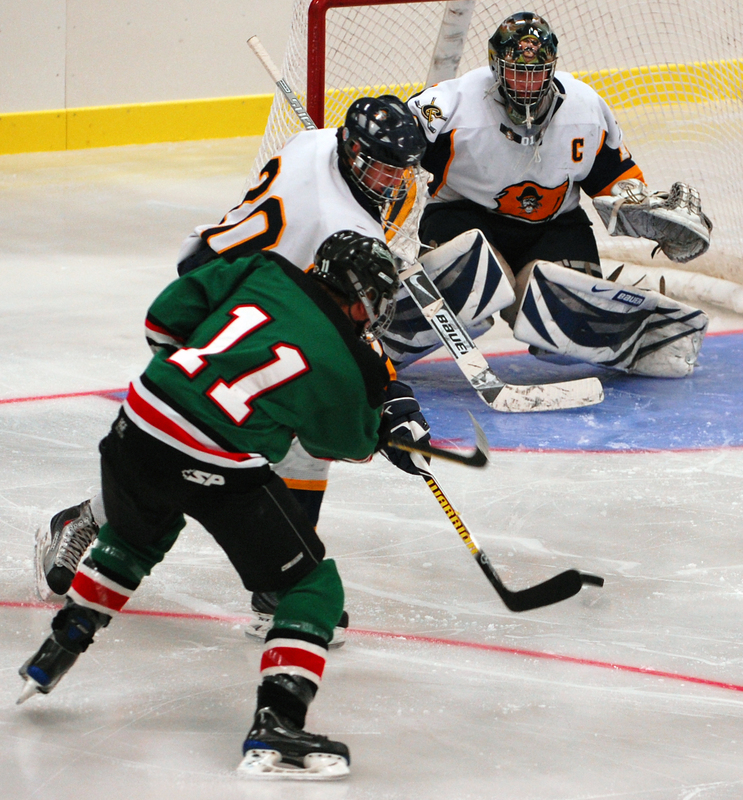 Turns out the wild finish wasn’t all that unusual in a series that receives less fanfare than Roseau vs. Warroad, another great northern rivalry, but is certainly no less intense. 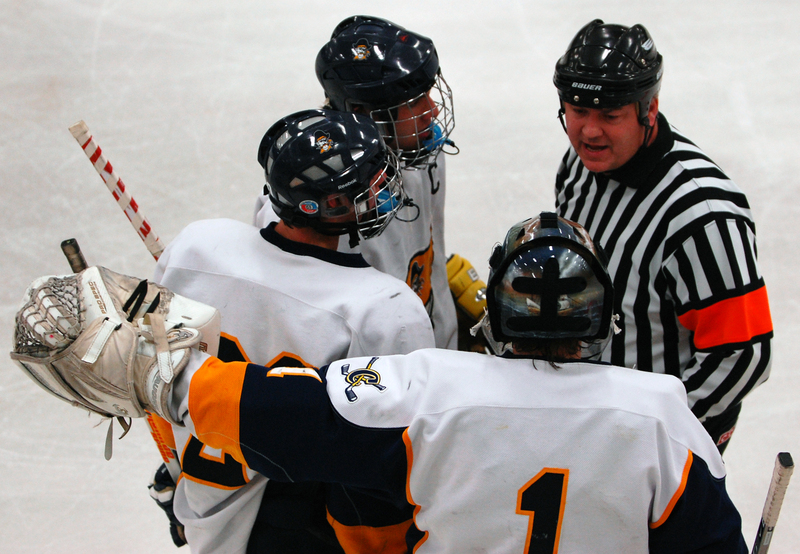 Useldinger, Terpstra and Regeimbal all did more than a little talking on the ice, and they clearly weren’t discussing the $15-million arena’s amenities or sight lines. 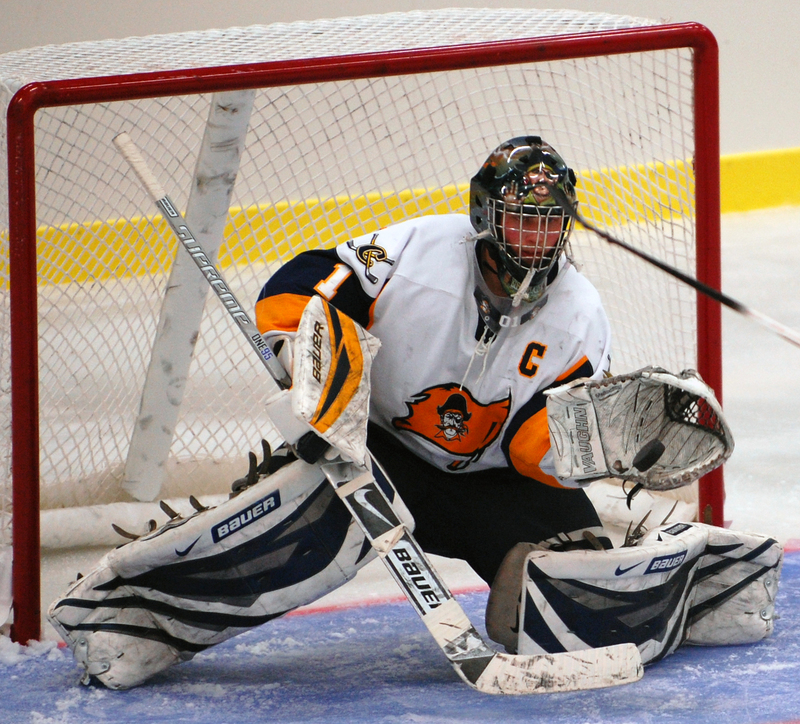 Pirates coach Jon Bittner, although unhappy about the final goal, said, in the end, the outcome couldn’t ruin what was a day-long Crookston celebration. 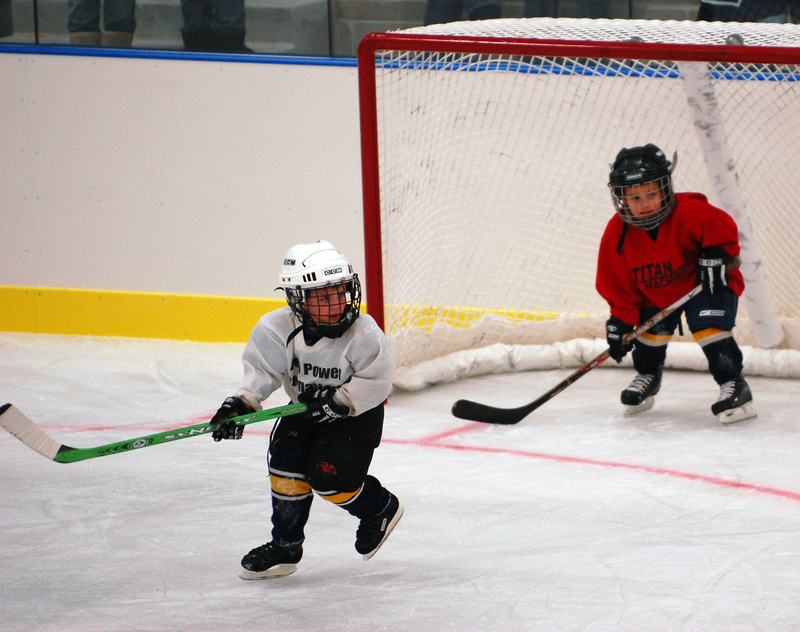 Festivities were held at the rink starting at 10 a.m., and by mid-afternoon, the facilities’ huge parking lot was filled and fans were parking along nearby streets and in adjacent neighborhoods. “It was an unbelievably special day,” Bittner said. “I’ve been around on and off a long time coaching, and wins and losses get jumbled up. 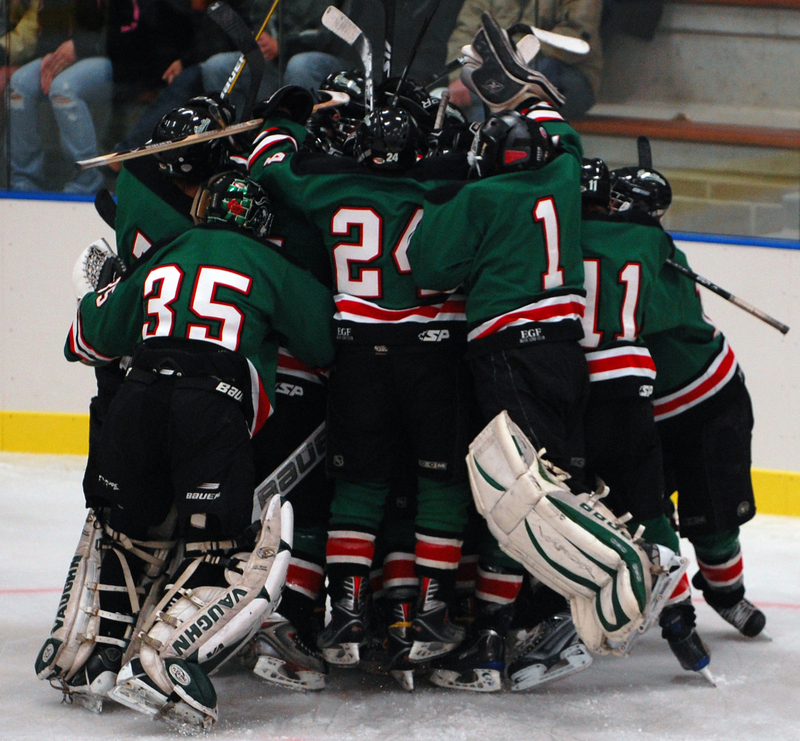 What’s important about hockey is the relationships you make with people, especially your players. 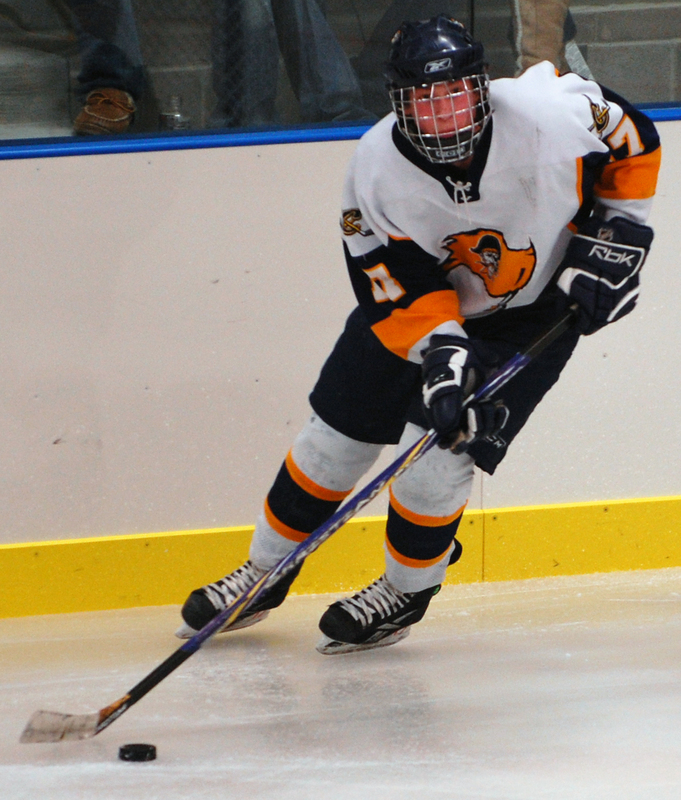 Sophomore forward scored the goal of the night when, while on a 2-on-1, blistered a shot top shelf to tie the score at 5. 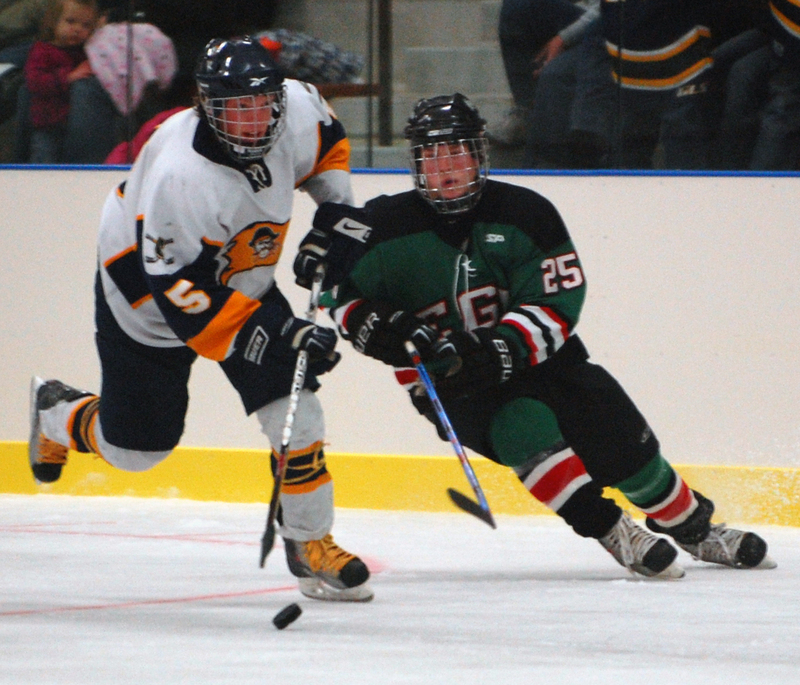 The goal was the speedy Lawdermilt's third of the game. 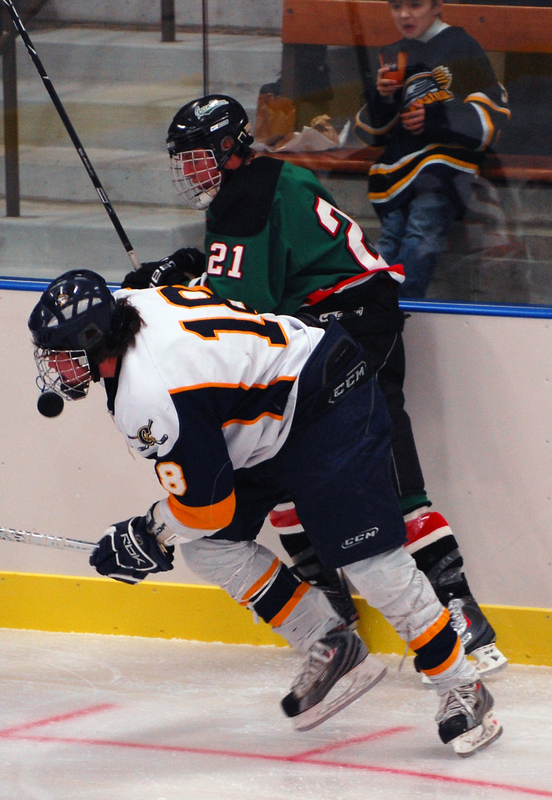 Scored two goals and was on the business end of several hard hits. 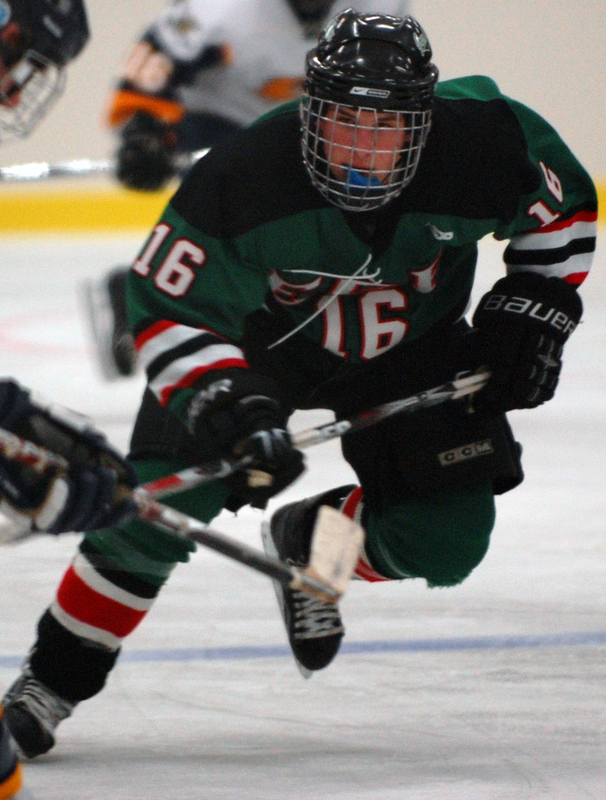 Useldinger's speed and tenacious play made him a threat to score every time he touched the ice. 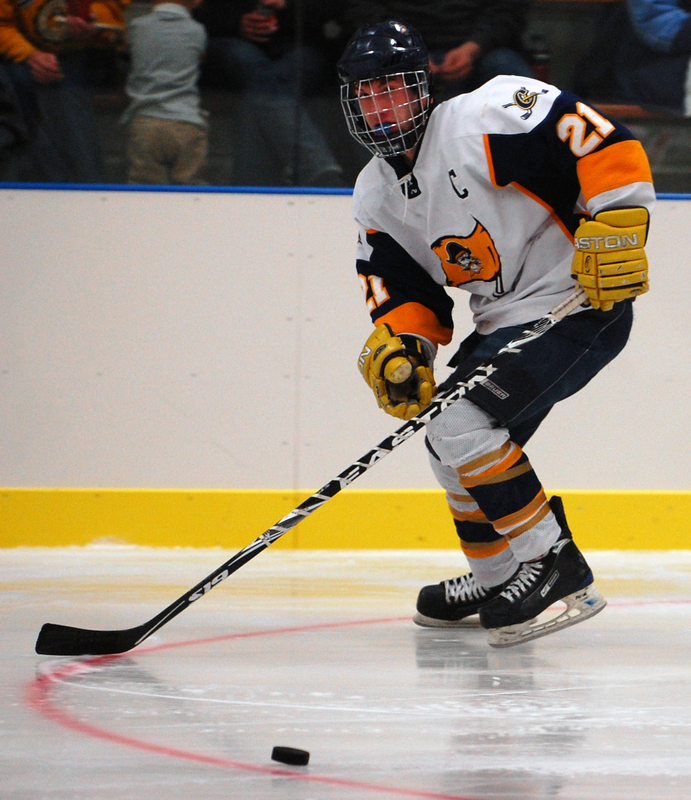 Senior forward (pictured below) scored two goals, including one on a breakaway, and missed several other prime chances. 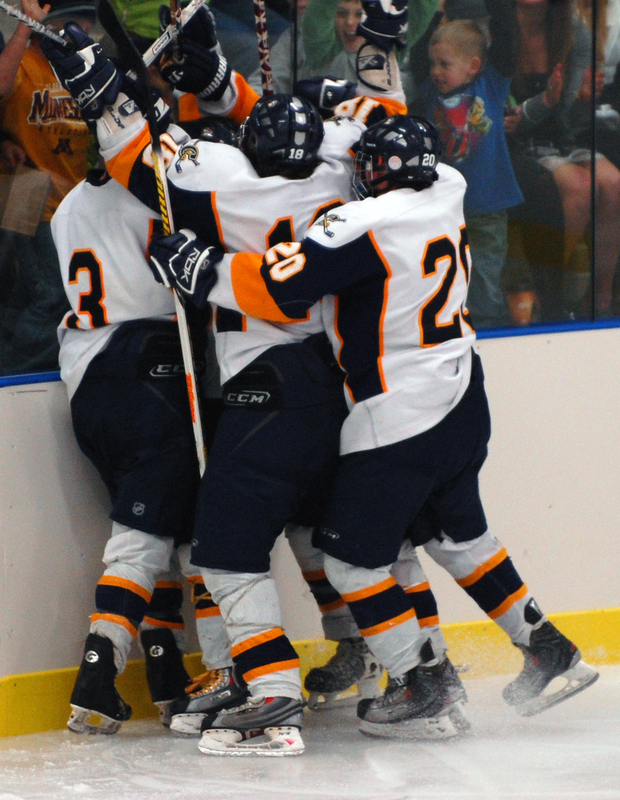 The new arena in Crookston? In a word, WOW! 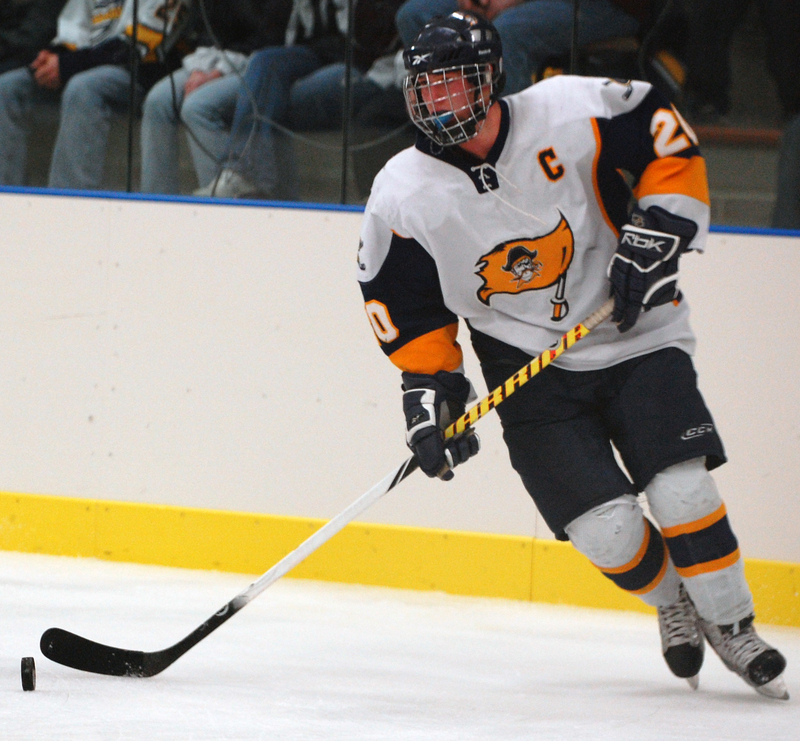 The $15-million Crookston Sports Center has three ice sheets, including a gem of a main rink that features a four-sided scoreboard above center ice, seating that wraps around three-quarters of the rink and the most pristine Plexiglass you'll ever see -- for one night, anyway. Hungry fans hitting the concession stand had all the usual rink offerings available to them, but a must-try at the CSC is the delicious -- if somewhat unusual -- Taco in a Bag. 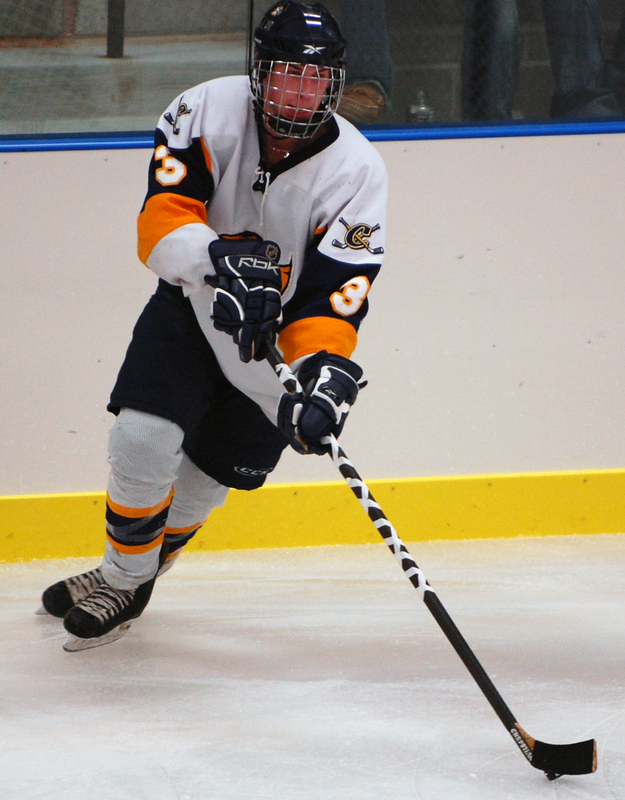 The Crookston girls beat Lake of the Woods 3-1 earlier in the day in the first game played on the CSC's main rink. 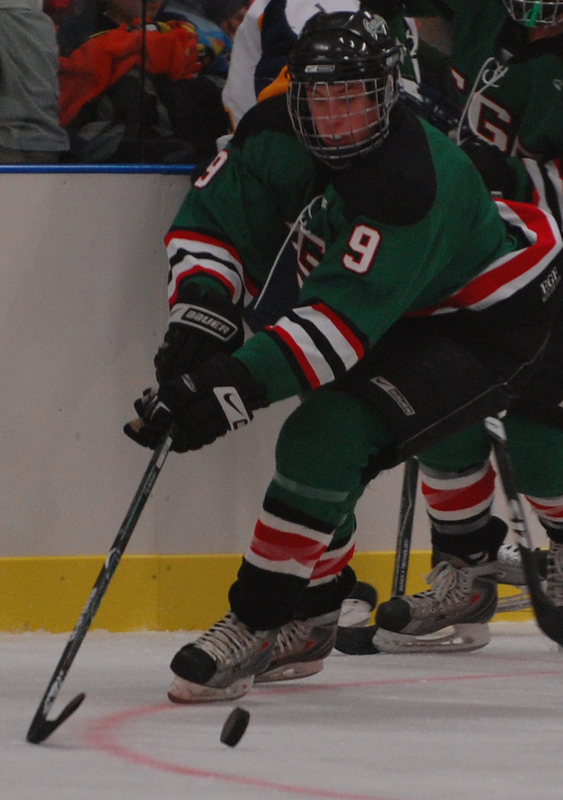 In boys action, East Grand Forks star Jake Useldinger scored the opening goal with 8:38 remaining in the opening period. 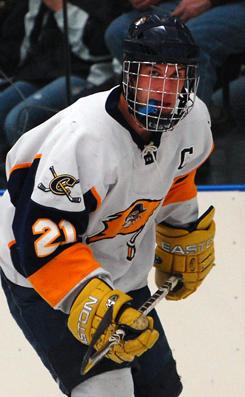 Crookston's first goal in the new building was scored by junior defenseman Kolton Walker. 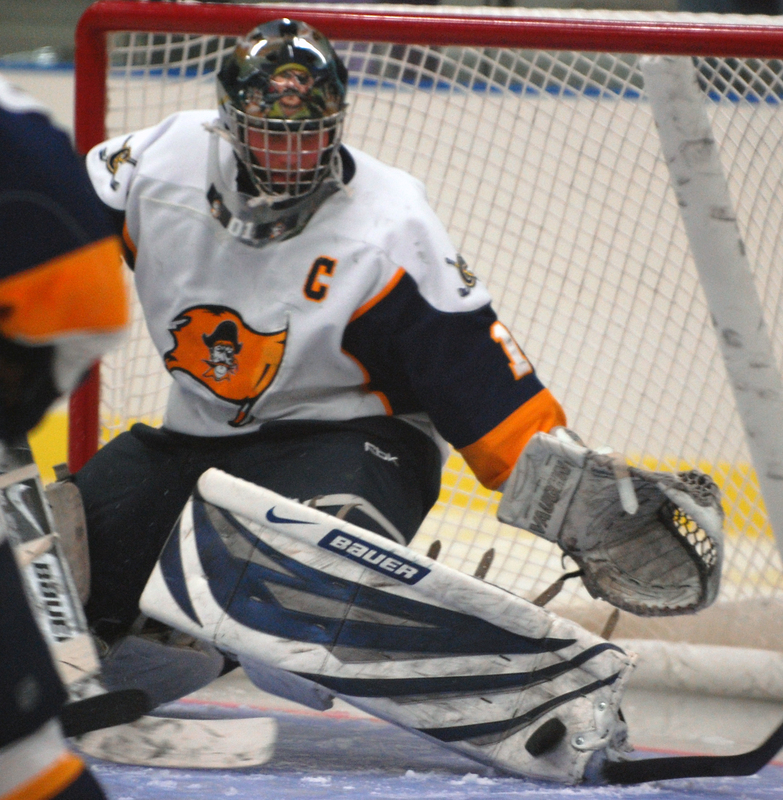 Morgan Terpstra also scored in the first period for the Pirates as they took a 2-1 lead. 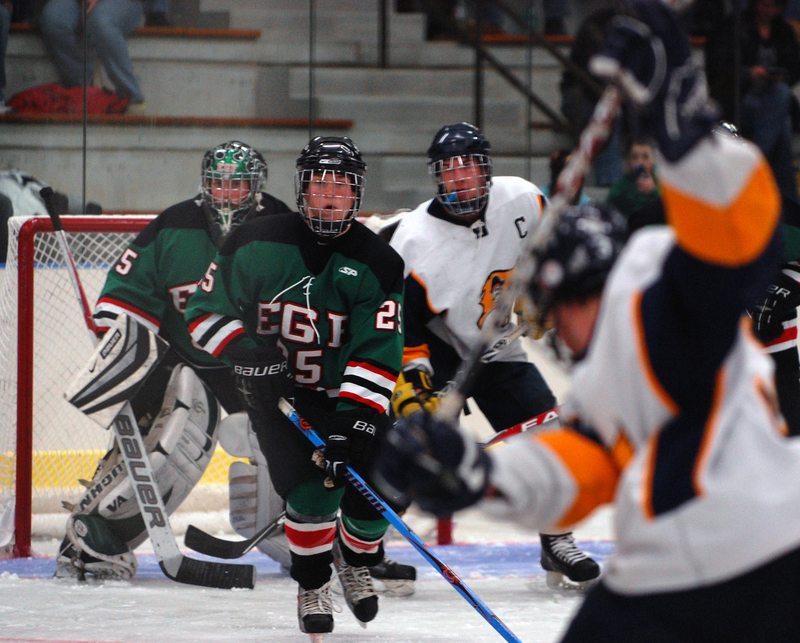 Evidence these two teams aren't particularly friendly rivals could be found all along the boards, where Crookston and East Grand Forks players collided regularly and with more than the usual zest. Big Nick Regeimbal, a junior forward who weighs in the 230- to 240-pound range was among the biggest of hitters, and he twice delivered crunching blows to the Green Wave's Useldinger. 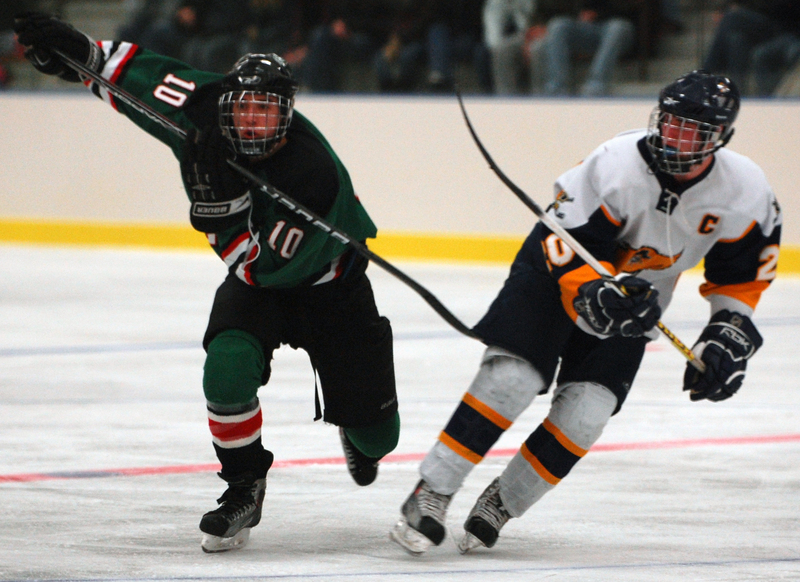 Crookston's Terpstra was on the receiving end of some of East Grand Forks' most bone rattling checks, including one early in the first period initiated by the Green Wave's Blake Christiansen. 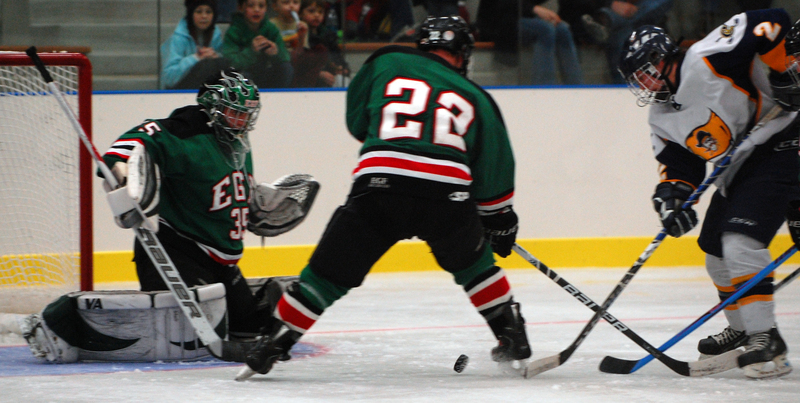 The speedy Terpstra twice raced in alone on East Grand Forks goaltender Beau Scheving in the second period. On his first breakaway, Terpstra scored with a nifty deke and shot between Scheving's legs. He tried the same move a few minutes later when, with the Pirates shorthanded, he scooted in alone on Scheving again but failed to score. 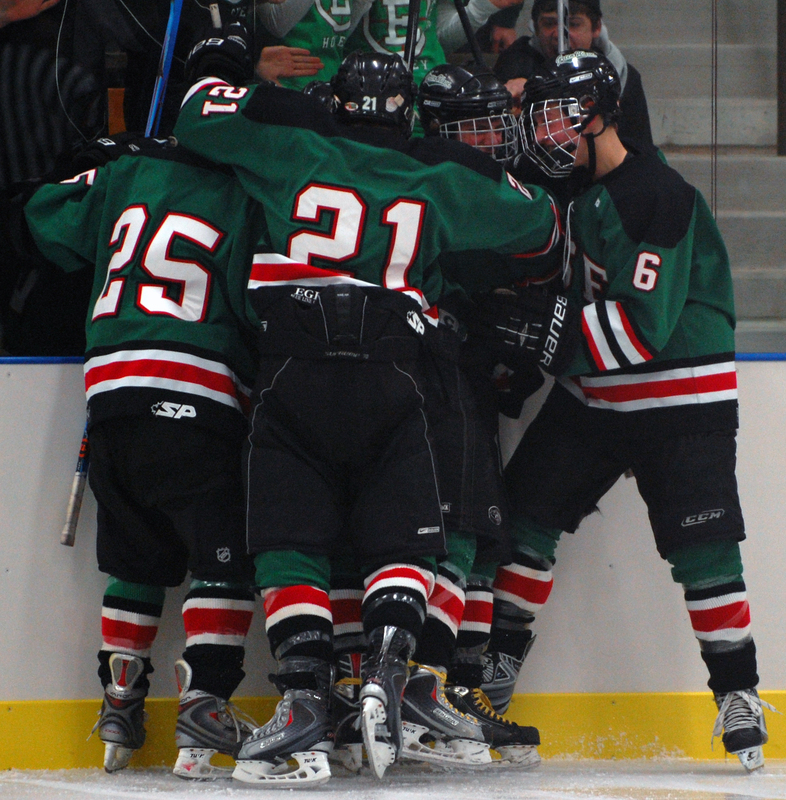 East Grand Forks rallied from a two-goal deficit midway through the third period to push the game into overtime, then won it on Adam Knopp's goal with 5:53 left. 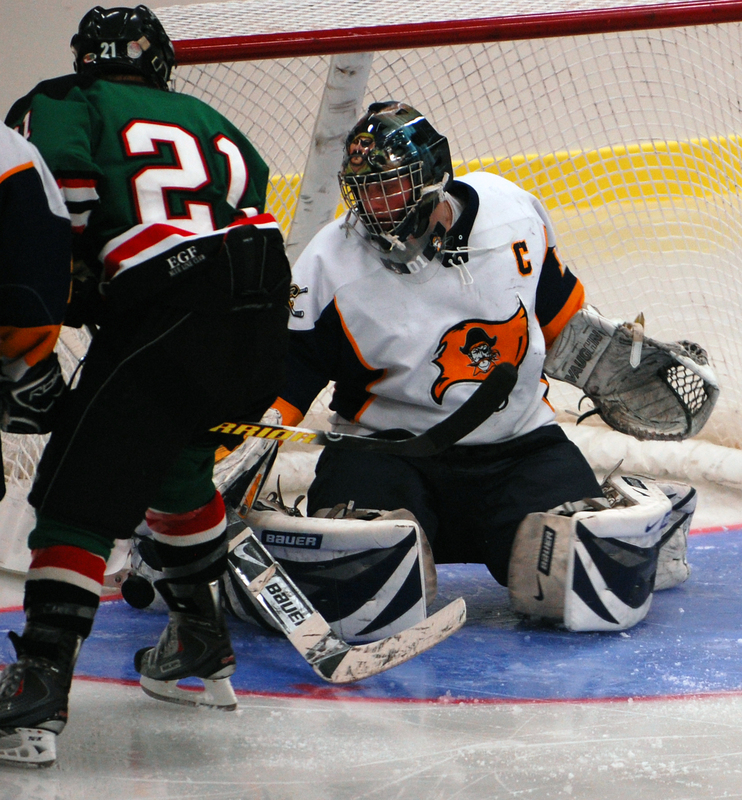 The Pirates argued to no avail that there was at least one Green Wave player camped out in the crease on the winning goal.